Our college library is open to all Hertford students 24 hours a day, 7 days a week. We have a constantly-expanding collection of resources – from novels and textbooks to scholarly journals and reference material. The library is a study space as well, offering plenty of desks with network points, WiFi throughout, and a computer room and printer for you to use. Unlike many of the central University libraries, you can borrow books from the college library. Undergraduate students can borrow books for two weeks, and postgraduates for four weeks. Our Librarian is on hand to help you track down items on reading lists, use online resources, access other libraries across Oxford, and reference material correctly in your written work – just let her know if you need help. If you have any questions about using the library and our resources just get in touch and we’ll do our best to help. As well as our day-to-day study resources, we also have an antiquarian collection of around 5000 rare books which are used for teaching and research. You can find out more about this collection on the Library & Archives page. We aim to be a welcoming study space and helpful provider of resources to all members of Hertford. Whatever your disability, we’ll work with you to offer the best possible service we can. 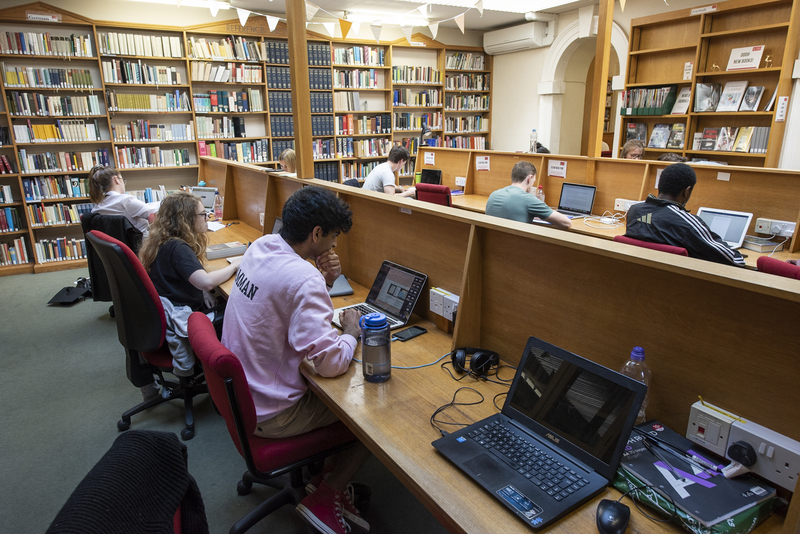 Examples of how we can assist you could include things like reserving study spaces within the library and arranging for books to borrowed by someone else on your behalf. If you’d like to discuss how we can work with you, don’t hesitate to contact us – by email, by calling 01865 279409, or by dropping in the Library Office, Monday to Friday, 9am to 5pm.